«You»: What have you DONE! What have you DONE to Galrick?!? Ryuusei: I would love to spend this time chatting. However I do have more pressing engagements on Deren. I will however offer you this final offer. Ryuusei: Serve him. Join my master. Be on the winning side. You know this will not end well. I will fight The`Galin with every breath left in my body! You are no true servant of The`Galin nor anyone but yourself Cartwright. Even if I were to accept him I could never accept you. I would serve The`Galin by joining you, master. I would avoid The`Galin by seeking shelter. Ryuusei: Well, you have chosen. Now, you have battles to fight and so have I! After racing to stop Ryuusei's forces from reaching The Temple of Hope, Galrick confronted him. But Ryuusei's power was too great, and Galrick has died at his hand! Twilly: Oh no's!! There are so scary monsters out here today!! Vince the Drakel is the mechanical engineer for Isle d'Oriens. His special weaponry will help a lot! Artix Krieger is a Paladin. He fights for the side of good and unity! Diviara, a brave Brilhado warrior, once general of the Devourer's forces, has changed sides! Robina Hood is lending us her ranger skills in the battle against the Devourer! You must become a Guardian to test the Shiny Boy power armor! Guardians can get the Shiny Boy armour from the chest, and refill their potions to 5 of each. Ryuusei: Hahaha! See if you can stop the rest of my armies from entering the Cor Dem Gate and reaching the Temple of Hope! «You»: Diviara, we seem to have defeated all of Ryuusei's forces on this side of the gate!!! Diviara: Friend, your enthusiasm is welcome but unfortunately-- unfounded. Some of the Network escaped through the gate, as well as Ryuusei himself. «You»: Then let's not waste a second of time-- THROUGH THE GATE!! Depending on your Chaos or Unity alignment, you will experience a different reply from Ryuusei! Ryuusei: Pathetic. Worthless. You have failed me already. They still come to stop me. Ryuusei: You must PAY for your failure. Agent Smith.......... DEAL WITH THIS PITIFUL EXCUSE FOR A SERVANT. Ryuusei: He is a failure and so are you. So are your people. Fighting always. Warring. You shall be obliterated by the Master too. Like him you will fail. «You»: Not before I make you pay for what you did to Galrick-- to everyone!! Ryuusei: Your posturing is amusing. Let us see you get through to me first! Agent Smith......... DEAL WITH THIS PITIFUL EXCUSE FOR A 'HERO'. Ryuusei: No-- I think not. You HAD your chance! Ryuusei: An interesting display to be sure. You of course cannot stand against my true power. I am tired of you. «You»: What is this cold... this cold is so much worse then before... I am a failure.... I stand no...chance. Diviara: You are assaulting them with the full cold in front of me? Have you gone mad?!?? Amilara: You! You are the one who ordered my mother killed! To unseat my father and claim his position. Ryuusei: Save your tears, Celegra! Your mother like all of your family was a traitor. Amilara: My uncle's death you only mourned as a military mistake. You planned to use me against my father. You let me hate him for years! Ryuusei: Boo hoo... a tiny violin plays soft music for the wounded Brilhado's pride. Amilara: And you threatened and chased my friends and hunted them down killing them in large numbers. Amilara: You... You....Now you turn the Cold on others against the orders of The`Galin and you call me a traitor. Diviara: Amilara, please go. WE will deal with Cartwright. Amilara: No, I think not, Father. I will not be shuffled off this time. Ryuusei: My heart bleeds for you! Amilara: Oh no you don't. You cannot manipulate me with the Cold, Cartwright. I am my father's son. Ryuusei: Who would have thought it would have been you? «You»: Wait, what? What happened I feel so odd, so worthless. «You»: So cold again but...You're right! The fight must continue. You got Cartwright! «You»: Is he talking to-- oh no! Ryuusei: Freely I am yours. Freely. The'Galin: The name is actually-- The'Galin. Amilara: Oh no-- What have I done?!? The'Galin: The Fall and the End are at hand. The'Galin: How unfortunate. It comes to this already. Nightbane: No! This cannot... What is happening to me--?! The'Galin: You are dying Nightbane. At long last you are passing. You have lived your life as a parasite and served your unlife even more so.You were worthy of .nothing save uncreation. The'Galin: You even attempted to kill your own son to advance your power. I however have seen all things and known you for what you are. So now instead of being uncreated you die. The'Galin: Ah. I made the right choice. She will know what you did. You will be remembered, in the end you reclaimed your honor. Sleep Nightbane. For you the end has come. Depending on your Chaos or Unity alignment, you will experience a different scene! «You»: What shall I do, master? Why do your people attack me? I am your servant! The'Galin: You are a treacherous dog. You will earn the fruits of your treachery. You are the epitome of deceit and evil, a pathetic being. Your loss makes the world a better place. The'Galin: I shall happily provide the instrument of that destruction. «You»: The`Galin! Why? Why do this! You are hurting the goddess you love! The'Galin: A mother will never turn on her children. Even as her children try to kill her and rob her blind. A mother will never do what's right, because it is not in a mother's nature. The'Galin: This hateful world of division needs to be cleansed. I shall be its cleanser. Now stand aside as I destroy this Temple. The'Galin: Caelestian! You dare not interfere directly with me! Falerin: Directly-- No, indeed not. Falerin: Delay Omega. We need more time. «You»: DELAY HIM?!? He just killed NIGHTBANE!!!!!!!!!!!!!!!! Falerin: To be sure, The`Galin, a father comes not to reprove but to reform. The'Galin: We .have kept our promise to yourself and to Galrick, Falerin. Falerin: I am already aware of that. 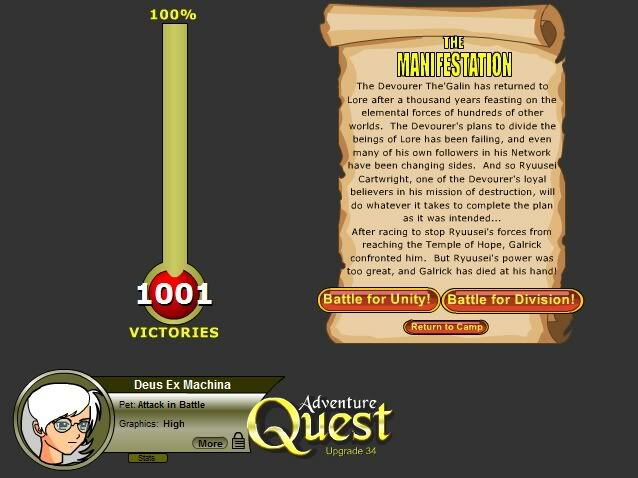 Thanks to weapon of choice, ArchMagus Orodalf, and whackybeanz. Correction from whackybeanz.